If you’ve been working in a medical administration role you may already have the skills and knowledge that form the Certificate III in Business Administration (Medical) BSB31115. You won’t need training in things you already know – you just need to apply for RPL. RPL is a simple process where we will assess you against the units that you already have skills and experience in. 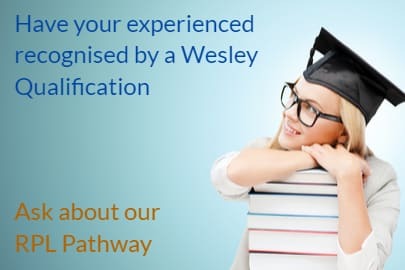 Wesley offer a complimentary RPL Eligibility Kit – whereby we invite you to fill out a detailed questionnaire to ascertain your suitability to enrol for RPL. There is no cost for the Eligibility Kit. The Kit will also let you know ‘gaps’ in your experience that may require a top of further training. The assessment is focussed wholly on you and your skills and experiences. You are involved throughout the whole process. We will need to assess your eligibility before inviting you to enrol in our RPL process. This is a simple process via our RPL Eligibility Kit. You will have a short assessment meeting with your assessor – the duration of this meeting will depend on how many units you are being assessed on but is generally 2-3 hours. If any additional information is required by the assessor you will be advised to provide this. If there are any gaps in your skills/knowledge you will be given gap training to complete. Once all of the assessments have been completed, you will be marked Competent in units you have successfully completed. Fees for RPL is $170.00 per unit and is not dependent on outcome. Students are invited to apply for RPL after completing our initial Assessment Kit.